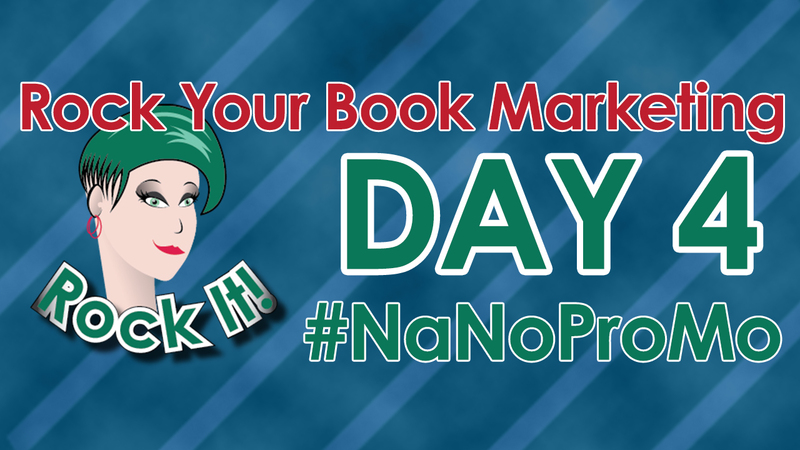 There is so much information available on tactics which authors can use to promote their books – including all the great advice here during #NaNoProMo – it’s easy to get overwhelmed. This can lead to you spreading your efforts too thinly and not being effective in any of your methods. Or, even worse, you’ll slump into decision paralysis, where it all seems too baffling and you end up doing nothing. To succeed in book promotion, while leaving time for writing and the rest of your life, it’s essential to focus your efforts. My favorite way of doing this is with the Quadrant Method. It’s a simple but effective technique you can apply to narrow down choices in many areas of your life. 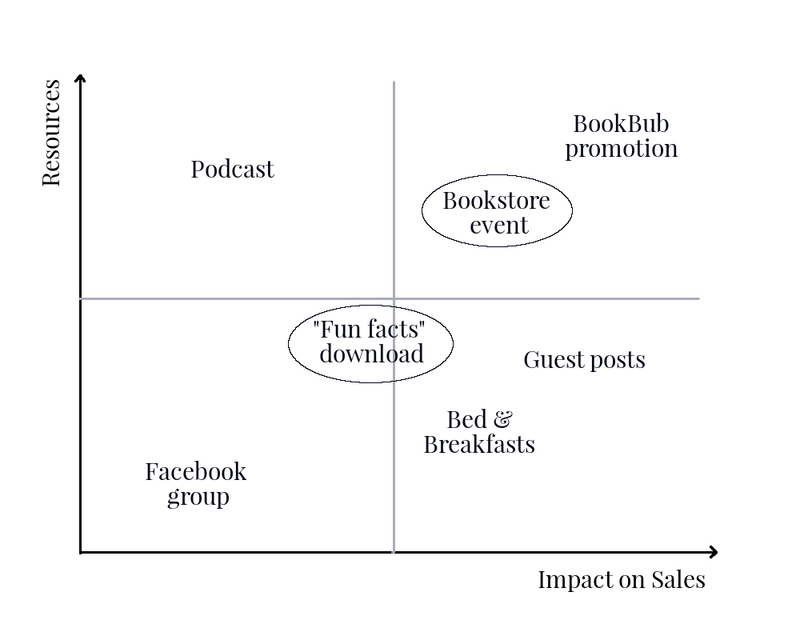 What is The Four Quadrant Method for Book Promotion? 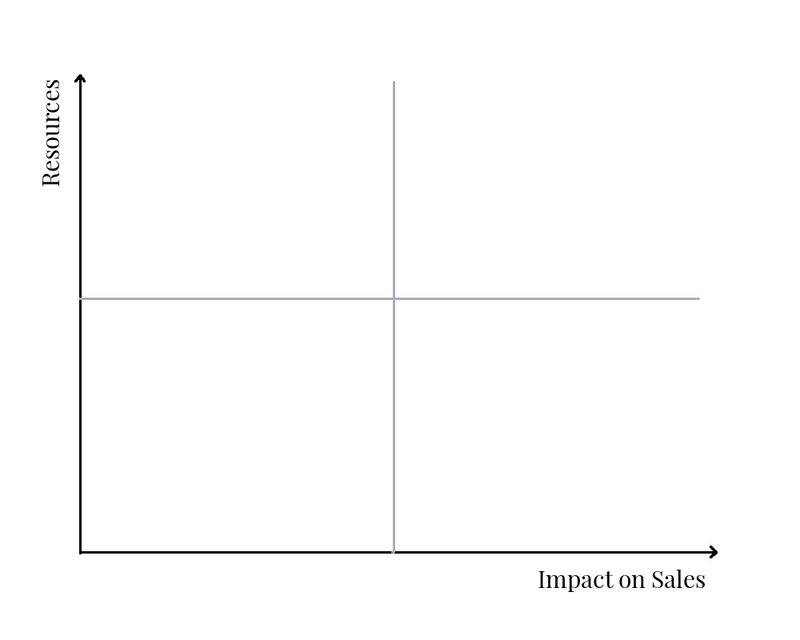 For each idea you’re considering, write it on the chart roughly where it belongs in terms of Resources (vertical axis) and Impact on Sales (horizontal axis). Don’t get hung up about exact positions, just go with a placement which feels reasonable. Resources represent both time and money. If, like many authors, both are precious to you, then measure the cost of your efforts as a combination. But, if you have a robust marketing budget and not much time, mark items as high in resources if they consume lots of time, with less consideration of money. And vice versa: if you have next to nothing to spend, but decent time to invest, then costly tactics score higher. You’re unlikely to be able to forecast Impact on Sales accurately, and you may be okay with either a short-term sales boost or longer-term awareness building. You can use gut feel here, according to where your ideal readers hang out, the nature of your books, and things you’ve heard are effective for other authors in your genre. Don’t confuse reaching people with conversion to sales: a tweet, for example, may be seen by hundreds of eyes, but if they don’t buy your book (or take some other valuable action, like subscribing to your email newsletter), the impact is low. Bookstore event: we already placed that as high for resources and impact. Join a Facebook group for local history buffs: this might place as low in resources (time) and low on sales impact. Create a “fun facts” download for newsletter subscribers: medium in resources (time) and medium for longer-term sales opportunities. Start a podcast: high in resources (time, money), low for sales impact. Apply for a BookBub promotion: high in cost but very high for sales impact. Guest post on a website for history fans: low-medium in resources (time), high for sales impact. Ask local Bed & Breakfasts to sell copies of the book: low in resources (time), fairly high for sales impact. Results of the Quadrant Method Exercise: Focus! High resources, low impact (top left quadrant): Stay away from these. Don’t invest heavily if you don’t expect a strong outcome. High resources, high impact (top right quadrant): Worth considering, but be sure to measure your results carefully. Low resources, low impact (bottom left quadrant): These might be worth pursuing, especially if you have times when your energy is too low for writing, or if you have a few marketing dollars left at the end of the month. The ideas you circled are particularly worth noting. Low resources, high impact (bottom right quadrant): These are your ideal activities to focus on. If any are circled, even better. Get started on them today! You can come back to your quadrant chart whenever a new idea presents itself, and/or to adjust placements once you’ve tried a few ideas. The trick is to narrow your focus and give a few tactics your full attention. You’ll enjoy your promotional efforts more and your sales will reflect your judicious choices. Don't forget to comment below to enter to win! 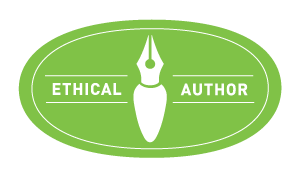 …is an author, speaker, and creator of The Serenity Project, a year-long personal experiment in techniques to juggle author responsibilities and boost creative enjoyment. 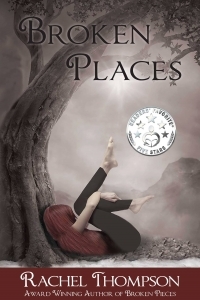 With 4 self-published books under her belt, she mentors other writers in the benefits of pragmatic self-care to promote both well-being and long-term career success. This is a technique that I’ve never heard of. Seems like a great way to prioritize or make decisions. Sarah, it’s wonderful for all kinds of decisions – just vary what goes on the axes depending on what’s important. I love using this to structure my thoughts on a range of topics. Thanks so much for having me as a guest today. I’m really enjoying all the #NaNoProMo posts so far! This is a really interesting approach. I think I am in “spreading too thinly” boat at the moment! Pamela, I’m exactly the same if I’m not careful. There’s such an “all-you-can-eat” buffet of promotional possibilities, it can be hard to pick just a few! There really is, and being fairly new to it, it’s so hard to know what will work for me and my books. This framework is so helpful, Pauline! I’ve been thinking about pursuing something that is high in resources … but probably low in the results I’m hoping to achieve. This post has given me so much clarity. Thank you. Great, very glad this was helpful! The geek/engineer in me loves this. Will put this to good use. Yes, Daniella, it appeals to my analytical side too! I’d never considered looking at promotional options in quite that way, but it makes a lot of sense. Thanks for a well-written post. Yes, Dana, it definitely helps avoid the temptation to try to do everything. It’s years (decades?) 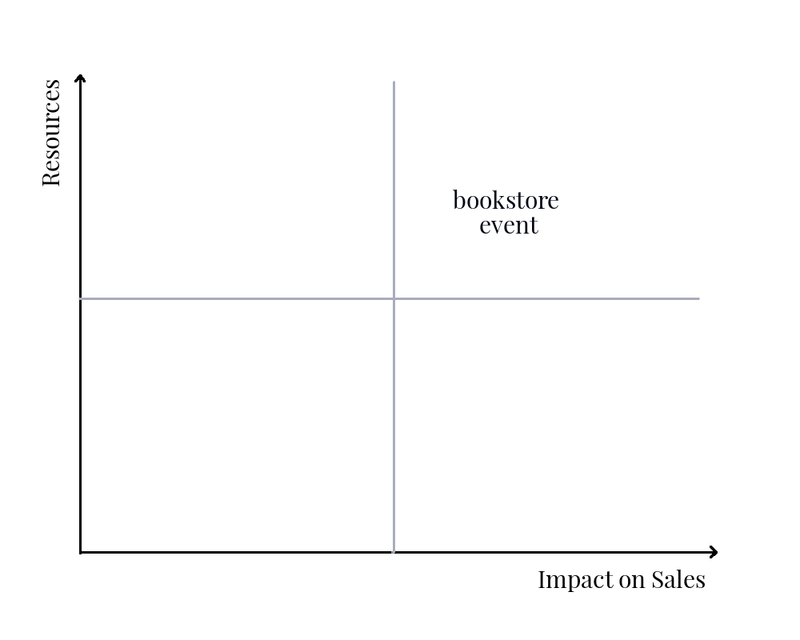 since I was first introduced to the 2×2 matrix, yet I’d never thought of applying it to book marketing. Thanks for the idea! I had never heard of the quadrant method (Eisenhower matrix?) 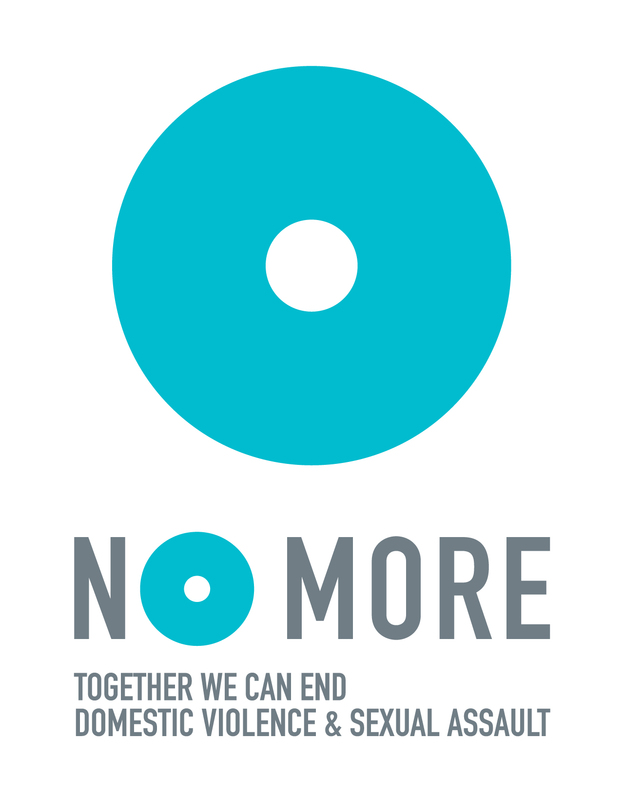 until this week- and now I’m reading about it again. Really liked how you applied this to books sales and I plan to study your post. Thanks! It’s a nifty little method, Jena, with so many uses! I hope you enjoy exploring it. I can easily feel paralyzed by overwhelm, not sure how to invest time and money into book marketing. Thank you for the 4 quadrant strategy, I can’t wait to try it! Author overwhelm is one of my pet topics, Kelly! Good luck with this method; I hope it helps.